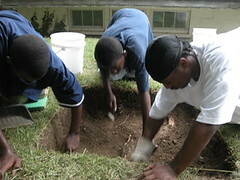 These three young men are hard at work excavating a 1-by-1 meter unit at one of our sites in Hampden. We are really lucky to have these guys. Despite wilting heat and humidity, they remain energetic and continue to learn the techniques of archaeological excavations. They come to us from the Baltimore City Youthworks program, which is paying their salary for six weeks this summer.